Scott Morrison, The Minister For Despair. Abbott sees older Australians as an easy target. He forgets how many are over 65 and their voting clout. This man should give us all the creeps. Does Abbott seriously think we the voters are stupid? Even people on the right are disturbed by the this sneaky, cold, piece of work. We should be worried because he will do a similar thing he did when using children as hostages in his last portfolio. Let me guess. He will set up needy groups to be against each other. It’s the short term.. I’ll give you this if you sacrifice the elderly. Ah yes put the old and poor up against the wall and shoot them. He might as well after all they are old and poor now! What use are they? But hang on I’m forgetting all those dole bludgers that just love not having a job. Get them into non existent jobs I say. 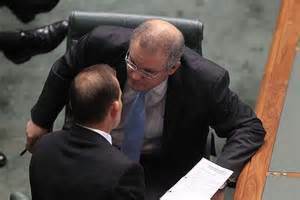 Morrison in charge of child care services. Jesus wept.